This essay was researched and published as a contribution to the exhibition ‘Living in a Modern Way. California Design 1930–1965’, curated by Wendy Kaplan and held at Los Angeles County Museum of Art (2011–12). The exhibition received funding from The Getty Foundation and was part of the ‘Pacific Standard Time’ series of events. Within the bold remit of developing an interdisciplinary exhibition, Aynsley was invited to contribute to advise on how graphic design could be interpreted in a curatorial setting. This included guiding object selection for the exhibition. Supported by the Getty (US$6,017), Aynsley attended three curatorial discussions at LACMA and conducted research in London, Los Angeles, San Francisco and Rochester (NY). The question of Aynsley’s research was how graphic designers contributed to defining ‘living in a modern way’ in mid-century California. 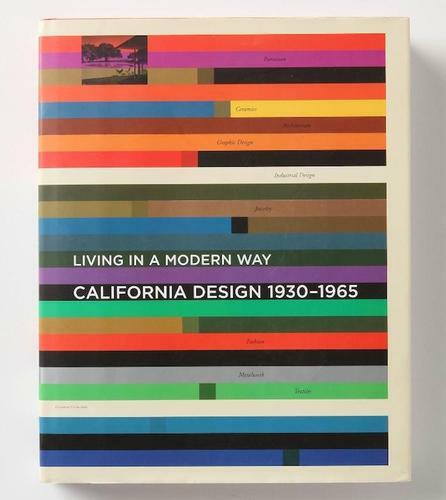 He argues that they manifested many of the styles and principles of Californian design in easily accessible visual forms, realised as magazines and book covers, posters and advertisements, and film-title sequences. Aynsley’s research offered a new interpretation of an under-researched field, identifying exhibits in archives, libraries and museum collections. Among designers interviewed were Lou Danziger, Jack Stauffacher and Deborah Sussman. The essay traces the origins of graphic design education in the state, designers’ migration from other parts of the US as well as Europe, and the embrace of experimental design by Californian business and cultural organisations, including Hollywood. It argues that California entered the field of modern design at a crucial moment for the development of a later stage of ‘informal’ modernism, through which the state became celebrated as graphic designers adopted new technologies and aesthetic ideas, moving from print to motion graphics. The exhibition, which travelled to Tokyo, Auckland and Brisbane, recorded 363,589 visitors to the LACMA installation and received extensive reviews.